I'm not going to pretend that I'm a know-it-all when it comes to tactics. But, hey, worth a shot right? Three games, one point, zero goals. Zero. Going into that Oviedo game, not even the most optimistic of Rayo fans expected anything out of that game. After such a demoralizing start to the season, even Faith had taken a vacation. And in the darkest of times, somehow, from somewhere, Rayo found the strength to compete. 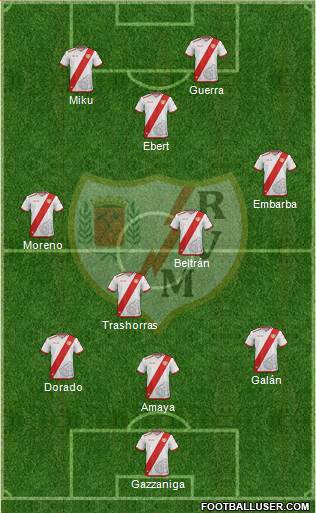 That fateful day, Rayo lined up a little like this, with Lass Bangoura playing instead of Santi Comesaña. Three things became crucial in Míchel's Rayo side. First is the defense - specifically the full backs. Second is the role of the media punta. And finally, the crucial roles of wingers Ebert and Embarba. It's a delicately balanced machine, that works well for these players. Ebert dribbles inwards with the ball. At the same time, Guerra moves slightly to the right. Who's covering for Ebert on the left? Moreno, a natural winger. Who covers for Moreno? Dorado, a player who has played at left-back before. Also, Embarba maintains the width of the team on the right. If and when he bombs forward too to provide a cross, who's covering for him? 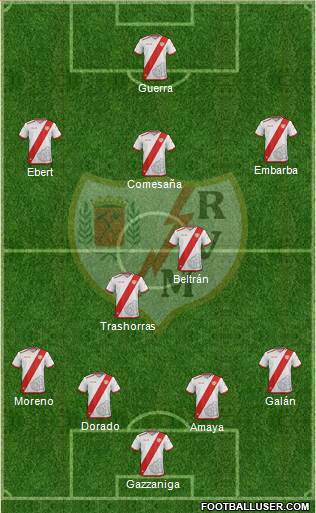 Ernesto Galán, who quietly plays two roles - as a right center back and as cover for Embarba. Now, Ebert has moved to the center, which means Santi drops deep in midfield - this is particularly important. Beltrán has taken the place, and will undoubtedly continue to take the place, of Baena. And while Beltrán is energetic and defends well, he prefers to intercept the ball and not tackle it. Therefore, Santi dropping deep gives Fran less space to cover. But what if that didn't happen? What if Santi didn't drop deep? Instead of Santi, imagine Miku and it's exactly the same - just that Miku is either distracting the left center back or Ebert is doing that and Miku is behind Ebert and Guerra. Either way, he has made a run forward rather than drop deep. This is very much more attacking. Baena/Fran now has acres of space to cover. Fran might be quicker but he can't cover space with the same grit that Baena can, which is why it is so important that Santi drops deep. However, as we saw at Girona where Rayo won 3-1 against a very defensive team, Santi is very much capable of playing that role, and scoring goals too. Here's the thing - this is quite similar to Paco. In the above plan, the media punta either chooses to join late as a third striker, or drop deep - especially if Embarba goes forward too. 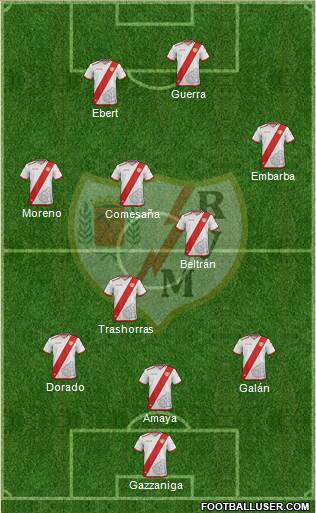 Compare it to Paco's Rayo: then, Trashorras would often drop deep, both full backs would push up, and both wingers would take turns to join the striker. However, the media punta would almost always join late as a third striker in 2012-13. After that, many factors meant that the no 10 role at Rayo changed. One of them was Alberto Bueno and his ability to score goals as well as play ridiculous balls from deep. The other was Trashorras' age - he could no longer run like he used to. And Baena's injuries psychologically took their toll - he no longer throws himself into 50-50 challenges like he used to. And finally, we must talk about the wingers. Patrick Ebert's performance against Oviedo was the best example - he effectively dictates the wing play. I also should point out that Embarba is more than capable of playing this role - he has shown that multiple times, especially with this amazing performance against Gimnàstic. Moreover, it means Lass can play - and with Ernesto Galán doing the dirty work he is "liberated" from defensive duties and can terrorize opposition defenses with his pace. But Ebert and Guerra have played alongside each other for years at Valladolid and now at Rayo - which means that the chemistry between them was something too precious to give up this season. However, Ebert's departure might mean that Embarba and Lass playing on the wings is a real possibility next season. This system is far from perfect - especially because Dorado and Amaya are old and slow and therefore are susceptible to attacks from the left wing. Which is compounded with the fact that Moreno is not a natural left-back, meaning that very good right backs such as Numancia's Unai Medina and Gimnàstic's Gerard Valentín have single-handedly torn this Rayo side apart. Also, Santi is still improving and isn't the best player going forward, which means too much responsibility falls on Guerra. The thing is, I hate it. I hate saying it. But from a tactical standpoint, Quini leaving actually makes sense. Baena leaving actually makes sense. Nacho leaving actually makes sense. They are all quality players. But Quini is a right winger masquerading as a right back, Baena is quickly going to be made irrelevant by Fran, and Nacho is a fantastic left-back who just doesn't fit the role Álex Moreno is playing. And the reverse is true too. Óscar Trejo coming in makes a lot of sense, and signals to a return of the 2012-13 days when Alejandro Domínguez ran the show. Or perhaps I'm wrong and it's more like the 2010-11 season when Óscar Trejo played further forward and Emilio Armenteros ran the show. Speculation is a fool's game. But what excites me more is that Míchel is designing a team that is complicated but effective, a team that has many delicate checks and balances but has few weaknesses. Quite surprisingly, he's designing a team that revolves around his player's past abilities - whether it be Dorado's past as a left-back, or Galán's as a center back, or even Santi's as a goalscorer. And importantly, either out of choice or circumstance, he's pruning the squad for the future. Essentially, I may be scared, but I certainly have faith. And this time it won't die out halfway through the season.